It is a thin layer of watertight material which is laid over the surface to prevent leaking. The waterproofing membrane is a continuous layer and doesn’t allow water to pass through it. This membrane is mostly installed over the structural slab on a flat terrace and below the finish tiles. 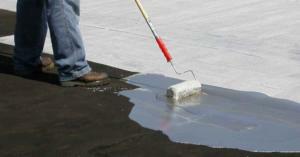 Waterproofing membranes are composed of a thin layer of watertight material. Mostly these membranes are 4 mm thick. These sheets are used to prevent the water from penetrating inside the buildings. It is usually applying to a building at the time of construction. The main purpose of these sheets to control the seepage and moisture. Where are the waterproof membrane used? These membranes include both the positive and negative sides. The positive sides membranes are installed to the face of the element which directly avoids the moisture to the exterior surface. Negative side membranes are installed to the surface of the element to avoid the moisture opposite to the surface. It should be strong, flexible and elastic, which can stretch to cover the cracks. If you are applying membrane sheets is to be exposed to the sun so the sheet should be ultraviolet first. These sheets have arrived at the site in the form of rolls. Then these sheets are unrolled and laid on a surface. Bituminous sheets are the most common type of membrane. In the membrane installation work, we have to provide an overlap of 4 inches or 100 mm to form a waterproof joint. Sometimes we use an air gas gun to melt a sheet and then overlapped them on the previously membrane sheet laid early. These sheets have the ability to stretch and can be stretch 1.5 time its original length. The sheets elongation or flexibility properties allows the membrane to stretch over the cracks. The membrane has the ability to withstand the tear and wear. You took a sample of membrane material in your hand and trying to tear the sample into two pieces. This gives us a fair idea about the sheets tear resistance. If the membrane is to places in a complicated shape like in beam-column junction, then you must be applied liquid on it. In sheet membrane, you should leave the gaps between the underlay and membrane sheet. These sheets are available in the form of rolls. Before it uses, it should be unrolled and laid on the firm surface. 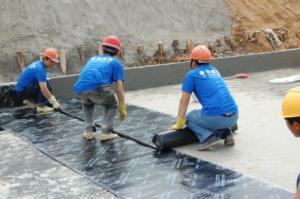 Bituminous sheets are the most common type of membrane sheets are used. Bituminous waterproofing membranes sheets are stuck to the substrate with the hot tar using the blowtorches based on adhesive. These sheets are 2 to 4mm thick. These membranes can be cut into desired shape and size to the surface area required of the roof. These membranes have come to the site in the form of liquid and then it can be sprayed or brushed on to the surface area. This type is totally different from the sheet type membranes in which no overlap, weld or steam is required. When spraying liquid forms of the monolithic membrane should be used. The thickness of these membranes is not fixed, it can be controlled as per your desired requirement. This layer is easily broken. The liquid-based membrane process is quick and finished in one day easily. For the large areas, it can take several days. These membranes have a property to stick to itself. The procedure of waterproofing in different building components. Clean all the surface area of the sloping terrace, and then applying a thick cement slurry over the surface of the terrace. You should be applying M-20 mix design of screen coat. This screen coat should be cured for the 7 days by using the wet gunny bags on it. Applying a cement sand mortar of ratio 1:4 over the finishing coat and waterproofing material as per design. Edge is provided between the parapet and the sloping roof of the next day. It should be cured for 15 days or putting gunny bags on it. Clean all the surface area of the chaja and using the chisel to remove the extra mortar on chaja and then apply a thick cement slurry over the top surface of the chaja. You should be applying M-20 mix design of screen coat. Applying a cement sand mortar of ratio 1:4 over the finishing coat and waterproofing compound as per design. This waterproofing compound is cured for a minimum of 7 days. Using the chisel, remove the extra concrete in the tank and clear its corners from concrete around the chamber. Applying a cement slurry of M-20 mix design or more to penetrate cracks and holes of the bottom of the slab surface. It is very simple to waterproof a water tank. Check out the inlet and outlet of pipes. If the pipes are not in rigid shape so grout is used to make the rigidity. Check the levels of pipes before the grouting. Adding waterproofing compound on cement sand mortar of ratio 1:4 on the corners of the tank and bottom of slab surface. Minimum 15 to 20mm thick plaster is provided over the surface. The top slab surface should not require waterproofing. This waterproofing compound is cured for a minimum of 7 days.